2017 is still not over yet but it was a great year for Hollywood. Now, it is time to look forward to 2018 and many new upcoming movie trailers have hit the internet over the last one or two months and fans are going crazy over them. Here are the new trailers for the upcoming movies in 2018. Sony’s next Spider-Man adventure apart from having him in Avengers: Infinity War is looking really awesome as they take a dive into the animated world, exploring Spider-men apart from Peter Parker and this new teaser gives us a great look at what we could expect from the movie. Warner Bros’ next big project is looking really incredible as it is going to be a visual spectacle telling a unique sci-fi story of the future. Imagine a digital world where you could do anything, be anything with the possibilities beyond the real world we are living in. It is a great concept and a must watch! The third movie in the Maze Runner series is finally coming out next year and this time around, the stakes seem to be even bigger. The first trailer for the movie was action packed and it ended on an ominous note, teasing an agonizing decision which Dylan O’Brien’s character must make in the concluding chapter. The second and the final one was even better as it was, even more, action-packed and gave a better look at the story. This is an action-packed story of one young woman’s journey to discover the truth of who she is and her fight to change the world. This new 20th Century Fox lives action Sci-fi flick is going to be really awesome to watch as it comes out on 20th July 2108. After making his debut in Captain America Civil War, Black Panther/T’Challa has now moved back to Wakanda and over there he will be challenged as a ruler as his competitor is going to have a different take on the throne of Wakanda. It seems that Marvel fans are in for an insane ride at Wakanda. The movie will be released worldwide on February 16, 2018, and it is going to start an “All Black” cast with Chadwick Boseman playing King T’Challa. The latest trailer shows us some incredible new footage of this action-packed film. This was the trailer that fans had been waiting for ever since the movie was announced, and when it came, it came with a bang! The biggest movie of all time is going to come out on May 4, 2018. It will probably be the best superhero movie of all time as it is going to feature a lot of big names like Robert Downey Jr., Chris Evans, Chris Hemsworth, Chris Pratt and many more. It will bring in the villain that is being set up since the first Avengers movie, Thanos which will be played by Josh Brolin. As soon as Thanos showed up in the trailer, the internet went crazy over it! The sequel to the record-breaking Jurassic World is set to come out in 2018 and it is scheduled for a June 22 release. Chris Pratt is going to reprise his role along with Bryce Dallas Howard. 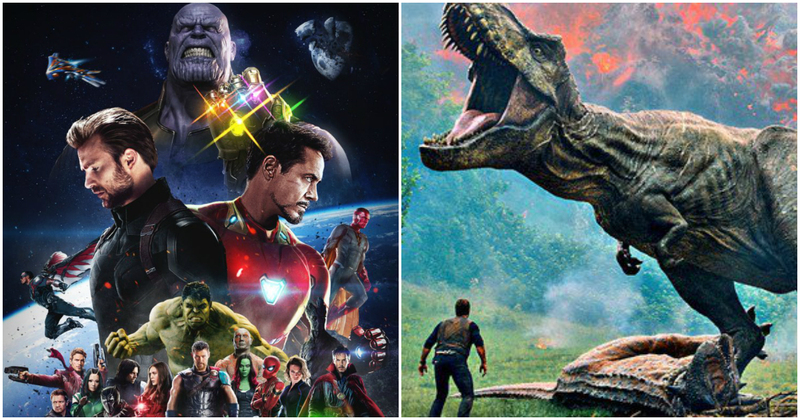 The movie will continue the story of the first movie further and take us to new thrilling Dinosaur adventures and the first trailer for the movie came out just recently, and it was totally insane! For all the fans of the Rock, we have good news. You will soon watch him in a sci-fi movie called ‘Rampage’. Dwayne Johnson plays the head of an anti-poaching unit who seeks to find a way to reverse the mutations on the animals before they destroy every city they come in contact with. The director has claimed that it will be filled with action and will be an emotional and scary ride. The movie will hit the theatres on April 20. The trailer for the movie pretty much shows everything that the director claims about it. Just have a look at it and you’ll see. Inspired by the imagination of P.T. Barnum, The Greatest Showman is an original musical that celebrates the birth of show business and tells a story of a visionary who rose from nothing to create a spectacle that became a worldwide sensation. It is going to star Hugh Jackman, Zendaya, and Zack Efron, and the latest trailer for the movie was just marvelous. This is the most anticipated R-rated movie of 2018 considering what the first part of the movie did. This time it is going to be much bigger and better as the number of characters has increased. Along with Ryan Reynolds’ Deadpool and the other cast members of the previous movie, we are going to have Cable (Josh Brolin) as well as Domino (Zazie Beats). Release date – June 1, 2018. We did not get a full-fledged trailer, but it was a 2-minute footage with Deadpool rambling about painting and stuff followed by a quick-fire footage showing some great action from the upcoming movie.